So far this year on the blog, we’ve featured a new Maine wedding venue, an amazing wedding photographer in Maine, and a Maine wedding cake designer and bakery. In today’s post we’re excited to feature another type of wedding professional that is critical to the success of weddings. While certain wedding venues may include everything you need to pull of your wedding, nearly all of our couples rely on a wedding and event rental company to source items, including everything from tents and dance floors, to tables and chairs, to linens and drinkware, and more. Today’s blog post is all about wedding and event rental companies in Maine and we’re so excited to feature the one and only One Stop Event Rentals located in South Portland, Maine. Being from Scarborough, I grew up going to One Stop! Back then, One Stop Event Rentals went by the name of One Stop Party Shoppe, but it was still the same high quality, one stop shop for all of your event needs. As a child I’d tag along with my mom when she was prepping for parties. Who knew how much time I’d spend at this store myself as an adult? I love One Stop Event Rentals for many reasons, and so do our couples. We’ve worked more weddings alongside One Stop Event Rentals than most other vendors, and their popularity should speak for itself. But, here are a few reasons I love having One Stop Event Rentals as part of our vendor team at so many of our weddings in Maine. Their showroom is completely interactive. For starters, the fact that this wedding rental company has a retail store that you can just pop into if needed is amazing! While they also welcome appointments, it’s nice to be able to stop in on the fly as we’re working to design, plan, and pull off our couple’s weddings and events. The One Stop Event Rentals showroom is conveniently located on Route 1 in South Portland, and it’s completely hands on, which we love just as much as our couples. That means you can touch, feel, and arrange all of the items in the showroom in order to design a tablescape that suits your needs. Their staff is beyond helpful. The front line in the showroom is always welcoming and willing to help. They are competitively priced. As wedding planners, this is a huge plus. There’s no need to price shop when you’re working with One Stop Event Rentals. You know the prices are reasonable when you get your quote. I asked my go-to girl, Kaitlyn Martin, a few questions to learn more about her family run business. Keep reading to learn more about the history behind One Stop Event Rentals, and what makes their event and wedding rental company unique compared to other rental companies in Maine. 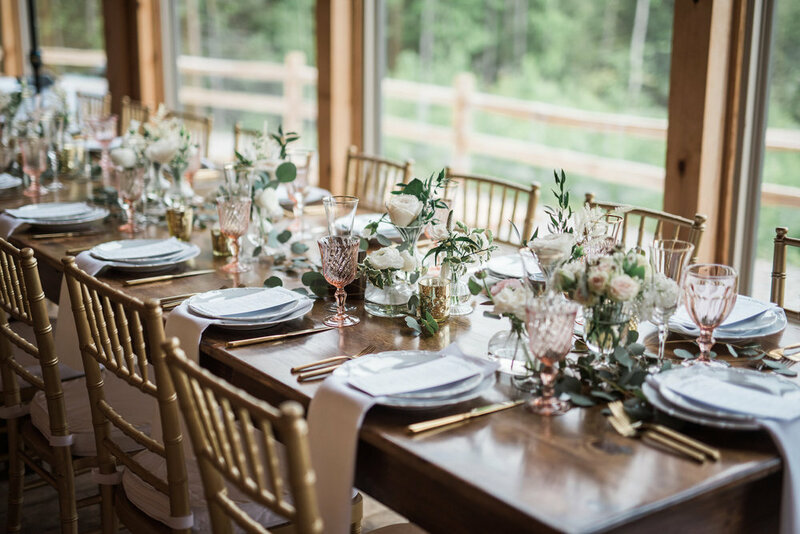 We’ll also scatter in a few of our favorite shots from styled shoots and real Maine weddings where items from One Stop Event Rentals helped us bring to life our final vision. How did you get started doing what you’re doing? One Stop Event Rentals comes from a line of family owned and operated rental stores. Our original rental company, Handyman Equipment Rental, was established in 1954. Following the great success of Handyman Rental, One Stop Party Shoppe was created in 1974 to service the party side of the retail and rental industry. In 2013, One Stop Party Shoppe was renamed and rebranded into One Stop Event Rentals to cater to the rising needs of rentals in the wedding and special events industry. With love for a good party, it was a perfect transition for us! What makes One Stop unique? At One Stop Event Rentals, we understand that everyone has their own styles, opinions, and needs when it comes to making an event extra special. Our interactive showroom, knowledge staff, and large variety of rental options help to encourage personal rental choices all while providing tools to create a cohesive order. Whether it be a backyard BBQ for 30 people or a four course meal for 300 people, One Stop has the capacity to accommodate a broad array of event rental needs. A day well spent is a day enjoying the company of good friends, homemade snacks, Maine’s beautiful landscape and as always, with a dog nearby. As a One Stop Team, it is pretty fair to say we all enjoy spending our time off having fun with our nearest and dearest, we are party people after all! Wha’s one wedding trend that you’re loving right now? The use of colors! In the centerpieces and tableware, in the linens, and even in the wardrobes! We really try to play up our inventory by incorporating different color palettes. It’s wonderful to see clients use their personality in their design and take advantage of our wide selection of rental offerings. 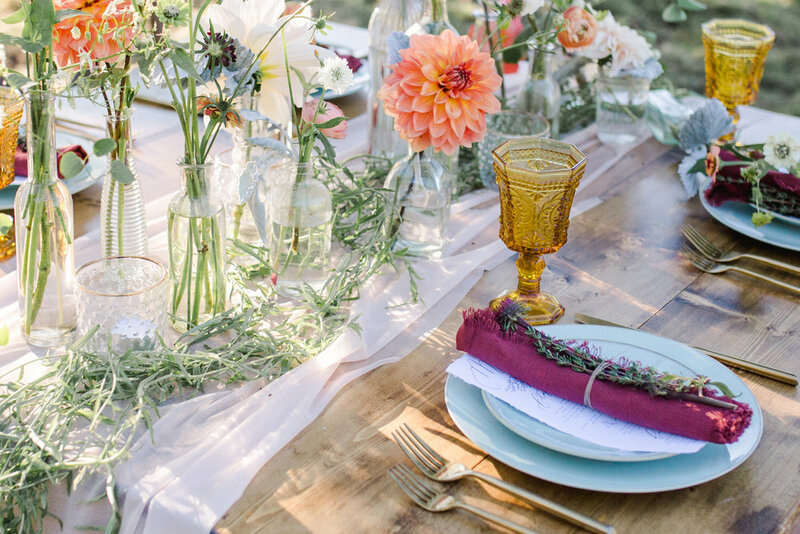 Between big ticket items like tents and dance floors, to the littlest details like linens there’s a lot to think about when it comes to planning your wedding and ensuring all of your rentals are accounted for. If this level of detail stresses you out, get in touch with us today. Our approach to wedding planning and design is collaborative. You’ll share your own vision of your event concept, and together we’ll make your vision a reality. And since no two events are the same, all packages are customizable to your needs. We can work together to make sure the planning process and timeline suits your needs. Review our wedding planning packages and contact us to start the conversation. If you’re currently working to select your team of wedding vendors, be sure to take a look at the other wedding professionals we’ve featured this year on the blog.